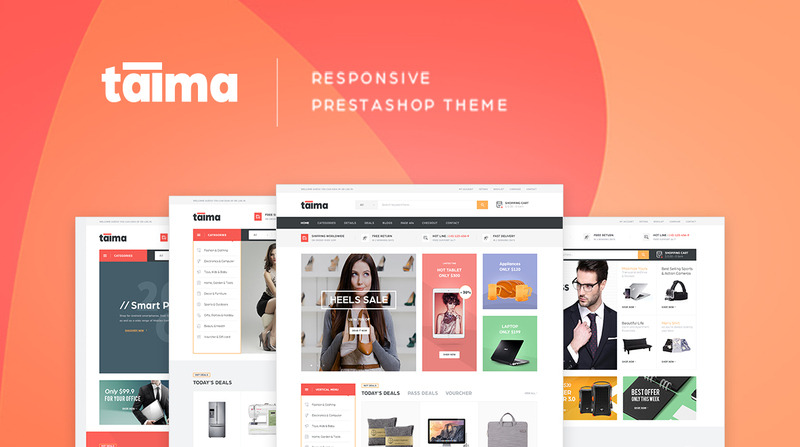 Pts Taima – Multi purposes responsive Prestashop theme for Digital, Electronics, etc comes with creative, modern and professional design. The theme is fully responsive based on Bootstrap 3. It is built with the best Prestashop Drag and Drop Page Builder to save you lots of time for content building. The SEO optimization make the theme friendly with Search Engines. In addition, it integrates over 50 Prestashop widgets, lots of shortcode to build content for your store much easier. Pts Taima is easy to customize, it has own intuitive theme control panel with all necessary built-in options and tools: megamenu builder, live theme editor, layout management, theme setting, compression, etc. The Prestashop theme is built with latest web technologies. Thanks to clean and well structured code base, the theme performance is improved a lot.